The 2017 RS Aero UK Nationals hit a whopping 110 entries, over a 50% increase on last year. This feat is all the more incredible considering the event is only five weeks after the Class’ first World Championship in France with similar numbers! All three rigs are well represented. This year sees a significant growth in the Youth and Ladies categories, both with over 20% of the total entry. International visitors travelled from France, Germany and Estonia to compete. Many thanks to Selden Masts on Day 2 for their turn providing the ‘Selden Saturday’, the refreshment drinks at the tally board – a good motivator for prompt tallying in! The daily prize giving and annual awards dinner followed and Ken Fowler of RS Aero Race to Scotland (http://racetoscotland.co.uk) fame came to thank supporters, present the awards and give a brief summary of his inspirational adventure. The fleet later returned to the bar to where Olympic DJ Mark Covell was pumping out tunes to party until late with the Hayling members. A few sore legs and tired heads resulted! With 15kn wind set to increase to 25kn and an ebb tide straight into the southerly breeze the sensible decision was made to sail inside the harbour for the final day’s racing. 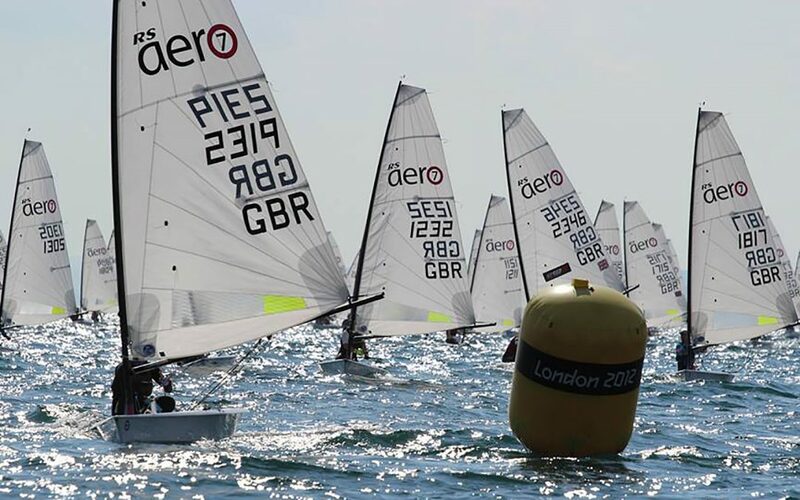 A quadrilateral course was set over the bank enabling two races to be completed in an increasing 15-20kn breeze whilst depth permitted. Each of the fleet’s scores were close and an enthralling final day of tight racing in the harbour provided an exciting grande finale. Pressure was on in the RS Aero 5s with just 1 point separating the leaders going into the final day with the breeze pumping down the harbour. Liina Kolk of Estonia hammered out two first places, leapfrogging the two leaders to take the RS Aero 5 title, 1st Lady and 1st International Visitor. RS Aero 5 World Champion Andrew Frost (Sutton Bingham) did enough to hold 2nd overall, 1st UK National and 1st Youth. Kate Sargent’s first race premature start dropped her to 3rd. Sander Puppart (Estonia) was 4th, just three points ahead of Lucy Greenwood (Oxford) who finished 1st Youth Lady. Top Junior (under 16) overall was 13 year old Ralph Nevile, recent RS Tera UK Champion, in 8th. Cathy Bartram (Chew) was 1st Master in 11th, pipping the 1st Grand Master, Caroline Martin (Lee on Solent), by a place. Sam Whaley (Swanage) started where he left off the day before with two 1sts to take the RS Aero 7 title and the overall Apprentice (under 22) title. He was pushed hard in each race by brother Ben Whaley (Swanage) who was coping well in the stiff breeze as one of the smaller sailors in the fleet, taking two 2nds, 2nd overall and winner of the overall RS Aero Youth Trophy (under 19). Kristo Ounap (Estonia), our Europeans Silver Medallist from last year, had already done enough to take 3rd overall. RS Aero 7 World Champion, Steve Cockerill (Stokes Bay), continued his comeback into 4th overall and 1st Master. Steve also took the win in the ‘All Aeros’ RS Aero Challenge Cup on Day 0. Top Lady was Sarah Cockerill (Stokes Bay) in 25th and 1st Grand Master (65+) was Chris Hobday (Gurnard) in 20th. 1st Junior (under 16) was Tim Hire (Royal Lymington) finishing a very creditable 16th in the strong fleet. Again just one point split the lead in the RS Aero 9s. Chris Larr and defending 9s champ, Peter Barton, were set to duke it out. Chi harbour is anything but sheltered at the top of the tide in a southerly and the onset of the ebb added to the wind and sea state. With 15kn increasing to 20kn during racing it was all on in the big rigs with controls tight and toe straps loose! Peter Barton eeked out a little extra speed to come through to win both races and the title. Chris took both 2nds for 2nd overall. Phil McCoy (Emsworth Slipper), having won Chi Race Week the week before knows the harbour well and took 3rd overall. Top Youth was Ben Charnley (River Ouse) in 4th on his first RS Aero event. Leading Master was Gareth Griffiths (Island Barn) in 6th . The Club Championship (best 3 sailors) was won emphatically by Team Estonia as they are all from one club – Pirita Svertpaadiklubi in Tallinn! Last year’s winners, Lymington Town, took 2nd. 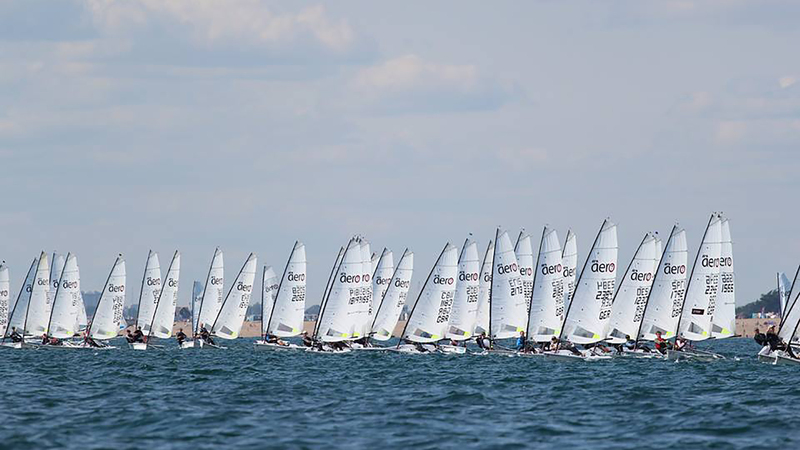 Hayling Island, with their huge team of 15, finished 3rd. Similarly emphatically, brothers Whaley took the top Family prize (best 2) with a 1,2 in the big 75 boat RS Aero 7 fleet. The Batchelor’s from the Isle of Man took 2nd from the Cockerills in 3rd. Over the three day series it was great to experience a very full range of conditions of not only wind strength but sea state and course area also. Thanks to HISC for their wealth of expertise and resource. Thank you to event sponsors Magic Marine, Harken, RS Sailing and Selden Masts for their support, a great selection of prizes, vouchers, gifts and the ‘drinks for tallies’ initiative! Check out the UK Events Page for details on upcoming events including the UK River Champs on the Trent at Nottingham on the 17th September and the UK Inland Champs at Northampton on the 28/29th October. 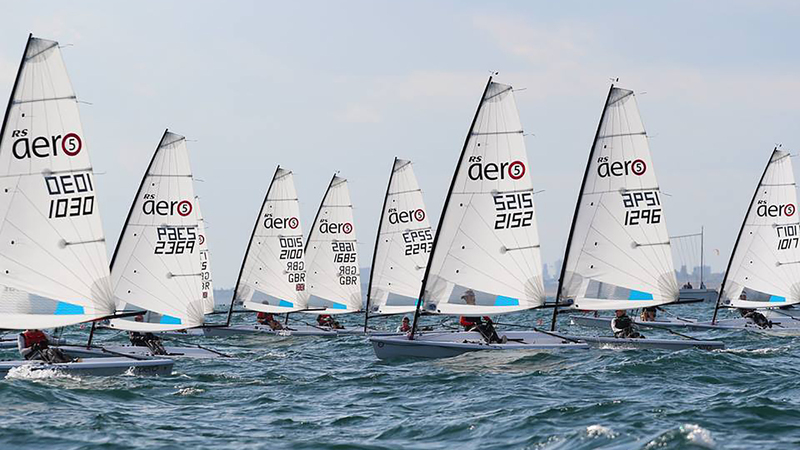 To extend your season with some late sun, join us at the Lake Garda RS Aerocup 7-10th October! You can also keep in touch with Everything Aero via the Facebook Group!